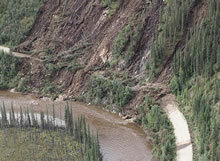 MP 116 aerial oblique: Taylor Highway Flooding – Debris Flow at O’Brien Creek. Date October 2010. Photo by NoReg Materials Section. 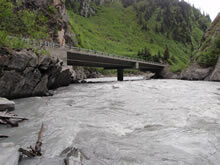 Lowe River Bridge #1384 in Keystone Canyon. Dated 2010. Photo by Bridge Section. Glenn Highway MP 92-97. Installing anchors for wire mesh. Dated April 2008. Photo by Central Region Materials. 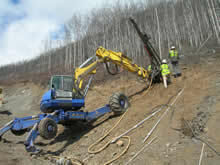 The Geology Group of Statewide Materials provides engineering geology and drilling/exploration services in the collection, analysis, interpretation and dissemination of high quality engineering and geological data, technical advice and reports required for the design, construction and maintenance of Alaska's transportation facilities in support of the Department's goals of safety, mobility and economic development. The Structural Foundation and Soils Engineering Group provides a full range of Professional Engineering services required to support the design, consturction and maintenance requirements for soils and foundations on the State of Alaska's highway transportation system. The Department’s Geotechnical Asset Management (GAM) Program Overview and Gateway is under development in parallel with our Transportation Asset Management Program. GAM incorporates performance and risk management principles in managing assets such as material sites, rock and soil slopes, embankments and retaining walls. These assets have a vital role in providing raw materials to build our roads and airports, as well as physically supporting our transportation assets and structures. The Statewide Materials Geotechnical Services group is actively conducting research to guide development of GAM principles and practices.